I've been wanting to learn how to develop film since I was a kid. 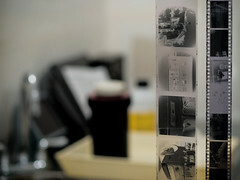 After going digital I didn't think I'd ever get the chance to do that cuz film is dead right? The Seattle Flickr group is what got me back into playing with film after so many years. We've had a couple of film only meetups with the group which got me into buying a film SLR and a Holga. You can find used film cameras for pretty darn cheap. So, one of the Flickr members offered to come over and show me how to develop film. I got most of the supplies off of Craigslist for pretty cheap. I still need to scan the photos so I can put some on Flickr but I got a roll of 35mm and 120 developed and am looking forward to shooting and developing more. I'm not sure if/when I will get into enlarging and paper developing. I have a feeling that will take up more time than I am willing to give right now but I wouldn't mind trying it at least once. I don't plan on doing any color developing and will be sticking to black & white. I'm not sure how much of it I will be doing. I still plan on shooting mostly digital and only getting the film camera out occasionally.